Unfortunately we were all running around so much that I didn't get a chance to take photos of all the food. 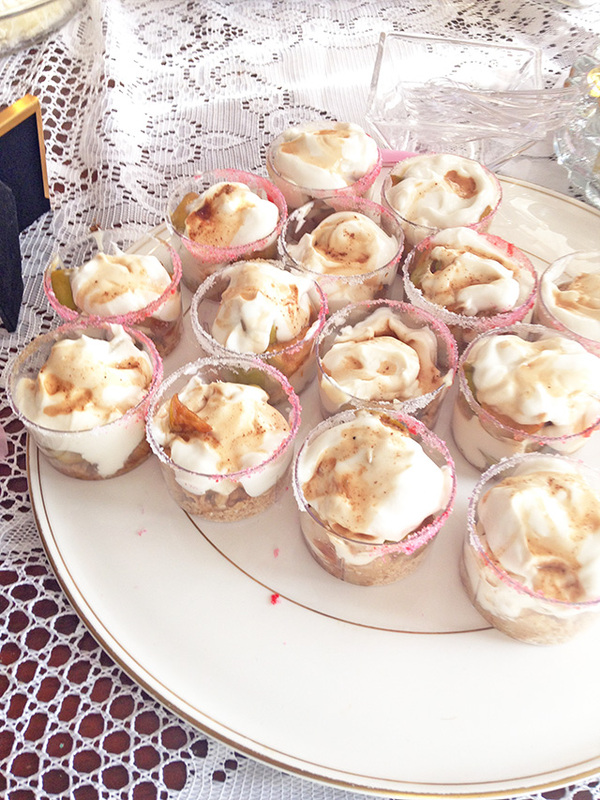 My girlfriend made these yummy apple cinnamon dessert shots layered with vanilla Greek yogurt and a pink sugar rim. 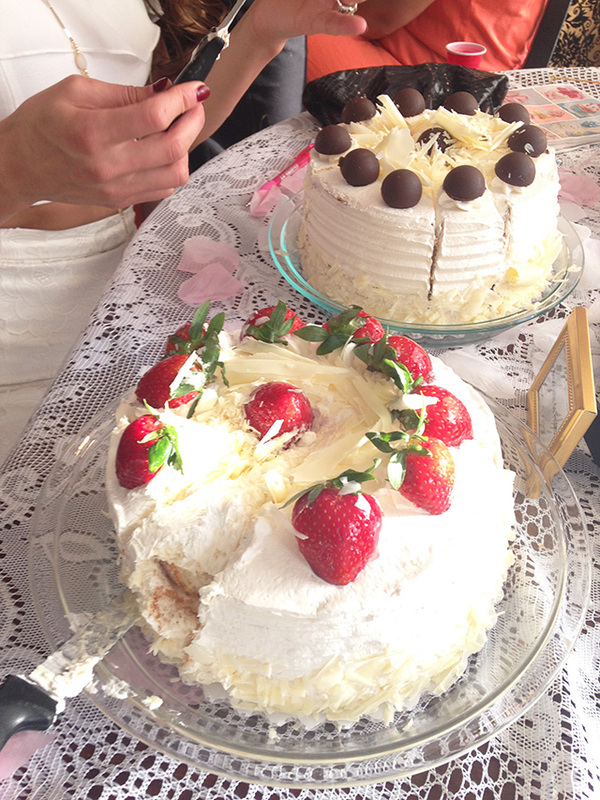 One of the lovely guests was kind enough to bring cake from her dads bakery which helped us slightly with the budget. It was absolutely delicious that I even went back for thirds! 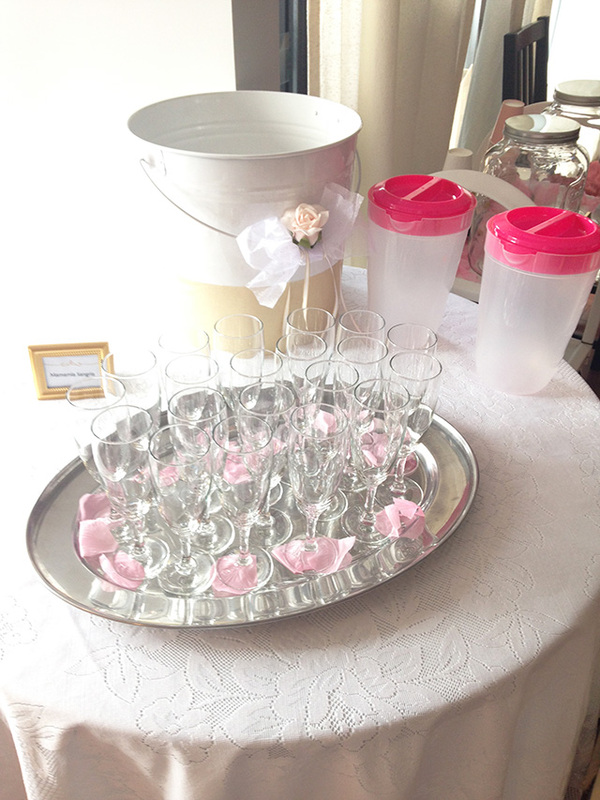 We filled the bucket with ice and champagne and as the guests arrived we handed them each a glass of chilled champagne. Off to the side we had an infused water bar with cucumber mint and strawberry lemon. 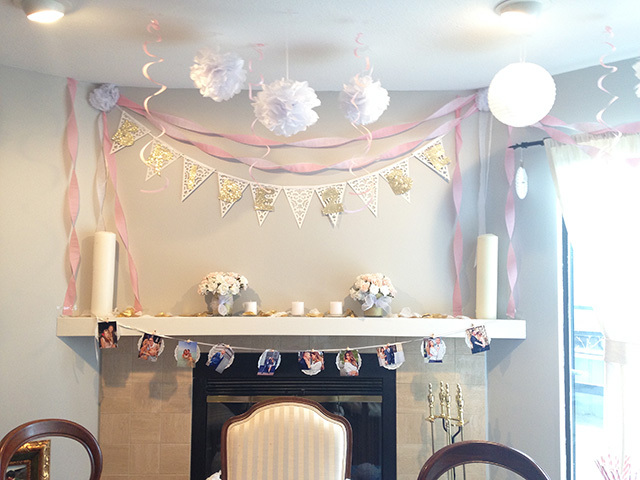 I got the picture banner idea with the doilies off of Pinterest and tweaked it slightly to match the theme of the bridal shower. I found small wooden clothes pins and painted them gold and glued small pink flowers onto each pin. 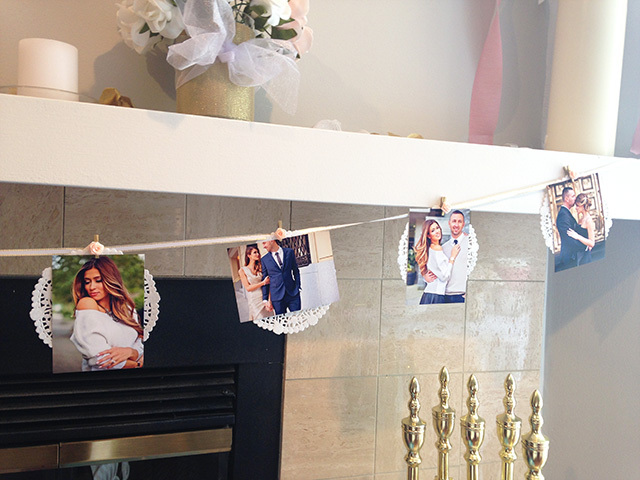 I then attached them to a thin white and gold ribbon and stringed them across the fireplace. I scored these beautiful flowers at the dollar store. They were a felted type fabric so they looked a lot nicer than the usual flowers you find at the dollar store. 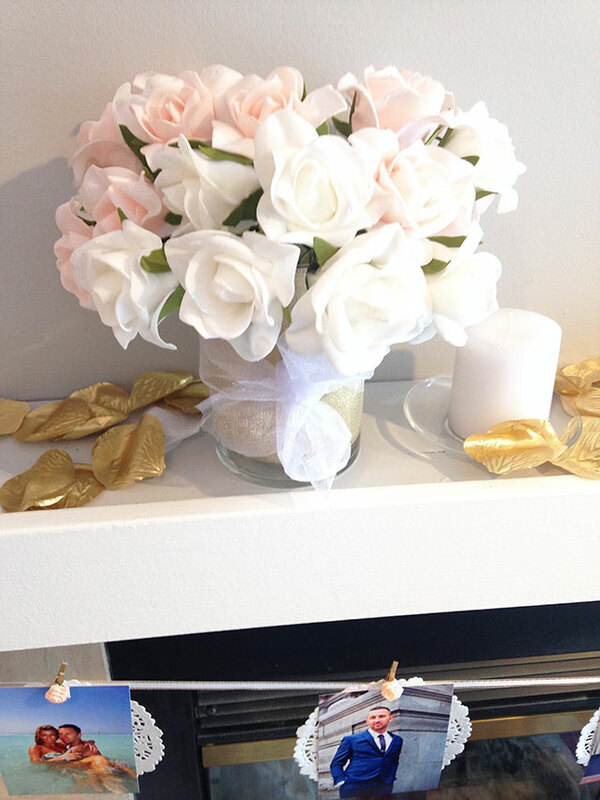 I then bought some gold and white ribbon to wrap the vases in order to hide the flower stems. 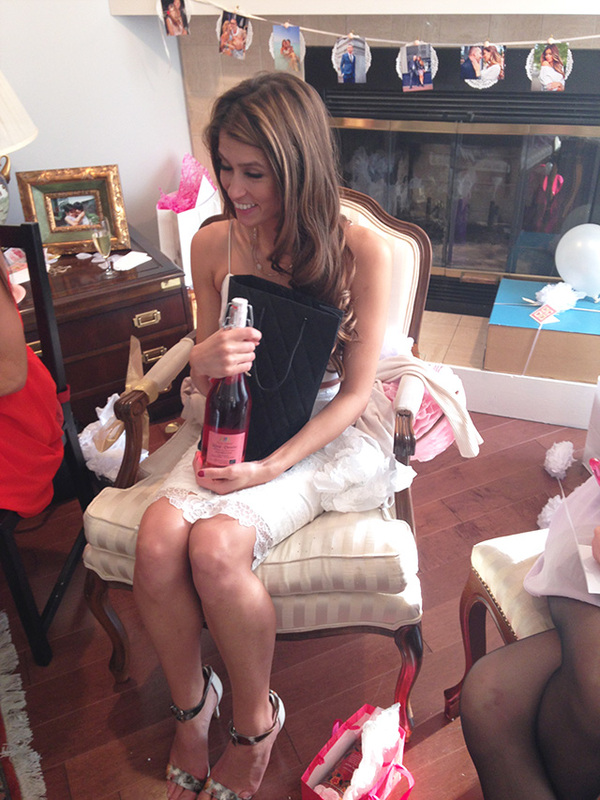 I had the pleasure of hosting my best friends bridal shower this past weekend along with three other beautiful bridesmaids. 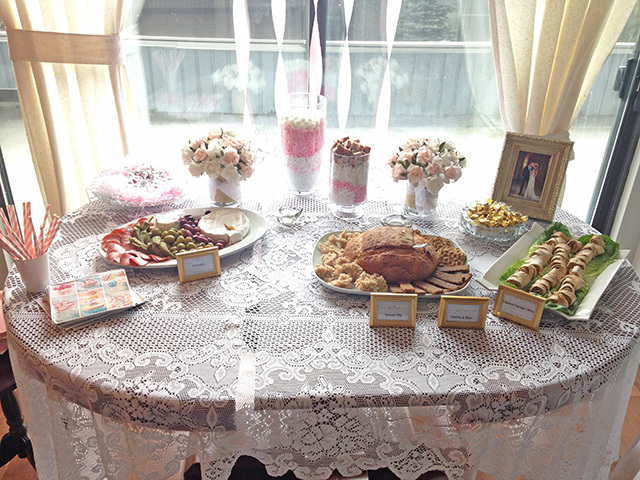 The theme involved gold, white and soft pink; similar to the wedding decor. The exciting thing that I can share is that I basically got all these items at the dollar store. I made sure that I went to a few different ones by my place as some of them around have better items than others. 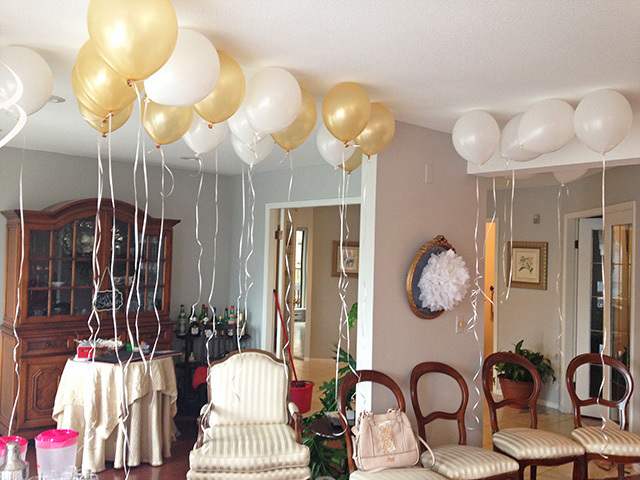 Most of the decorations were tissue paper fluffs, balloons and streamers. The most expensive item from the decorations ended up being the clear vases that I purchased for $20 each CDN. I ended up buying three different styles to fill with tissue shred and candy, but one of them ended up breaking in my car. What a beautiful party! Love everything! Absolutely beautiful! You can tell how much thought and work went into creating this lovely atmosphere. Fantastic job! OMG...I am dying right now! This shower looks so beautiful! You did such a wonderful job!!! 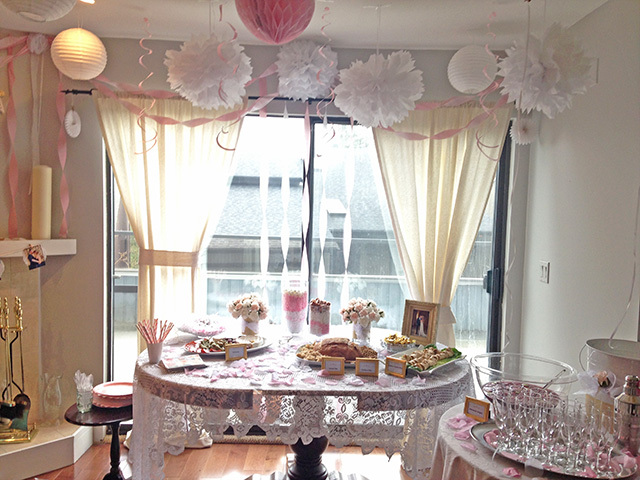 The food and decorations, everything looks perfect. Your best friend is one lucky lady:) Sorry the vase broke in your car. That's a bummer, but everything else looks amazing and I can't believe you got most of it at the dollar store! Thank you so much Joanna! It was definitely a lot more work than I thought, but so worth it as my girlfriend was extremely happy. 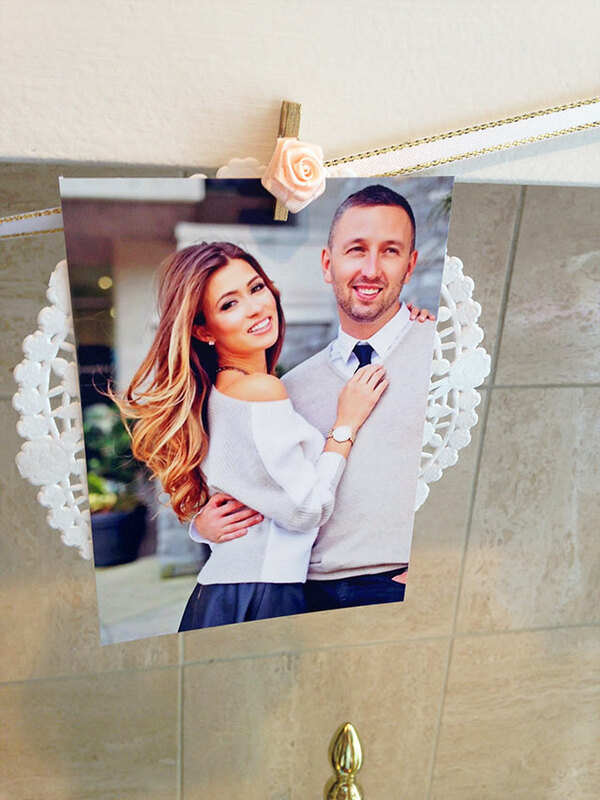 We have the exact same taste so it works perfectly because I basically designed it how I would do it for my own bridal shower lol! and the dollar store definitely has some really good pieces, but I even found that some to be quite expensive, such as the vases and Michaels craft store to be even slightly cheaper. Thank you so much Gabrielle! It took a lot longer than I imagined and maybe that's because I wanted all the details to really stand out:-) I'm kinda a perfectionist in that way.. But I can't take all the credit as my lovely gf did all the food! She really did such an incredible job along with the two other bridesmaid we all worked to create a lovely space for our amazing friend. Oh my goodness! This is the most beautiful shower I have ever seen! You did a fantastic job! I really loved the picture banner you made. Just wow! How exciting!! Y'all are too cute! This looks so amazing! 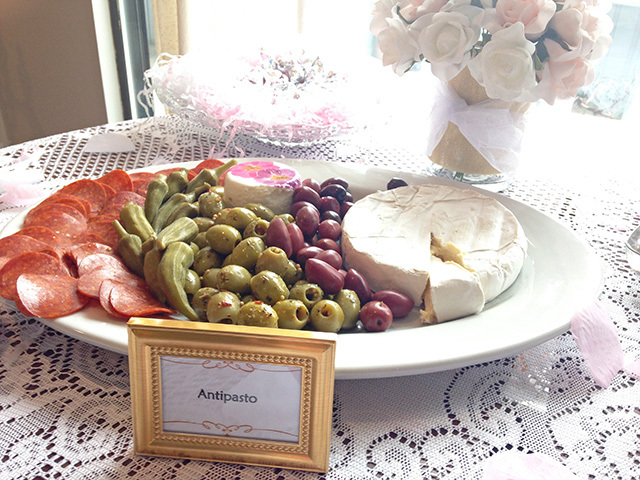 You're making me want to have a bridal shower now! (I probably won't have one) but this one looks so cute and like it was so much fun. Great job finding everything at the dollar store, I wouldn't have been able to tell. Thanks Carissa! Definitely some great finds. I actually wasn't planning on having one either, but after all the work this one took I kinda want my gf to have to do one for me:P :-) lol. This is wonderful! 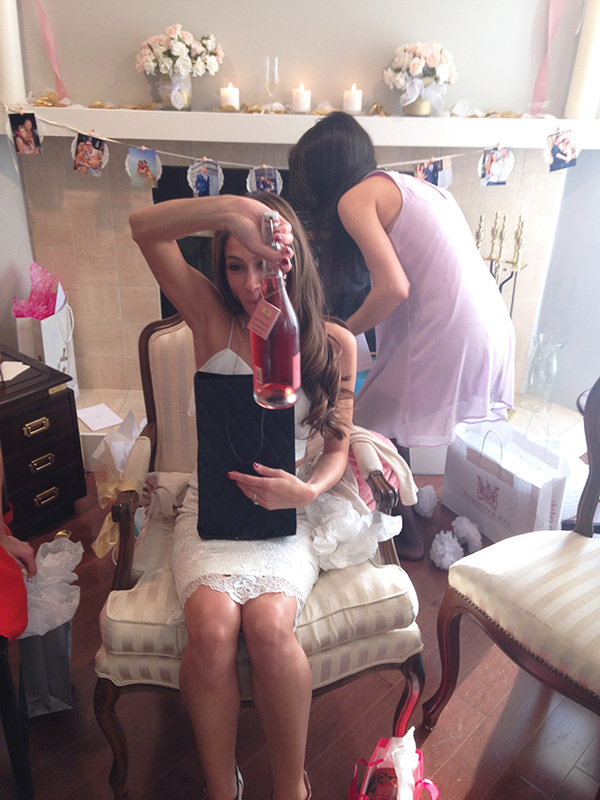 What a fabulous bridal shower!! 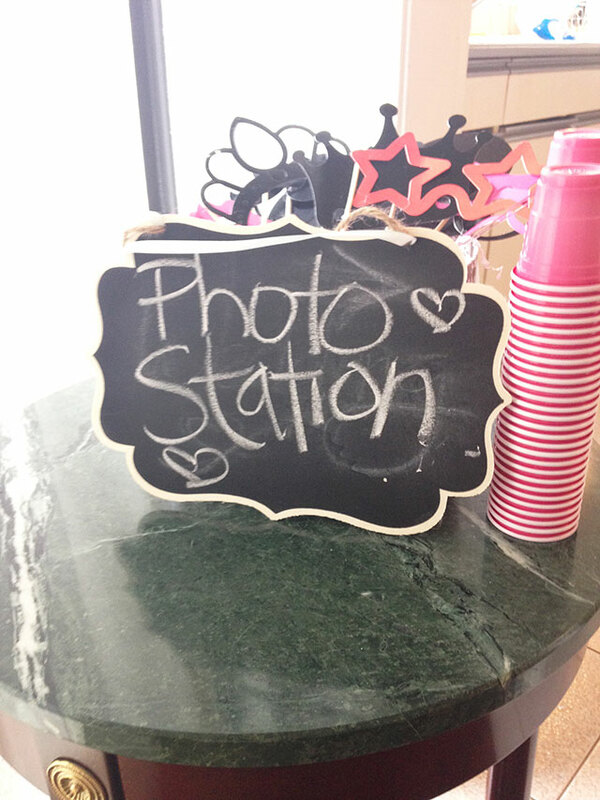 I have not yet hosted one for a friend but now have some fabulous ideas! 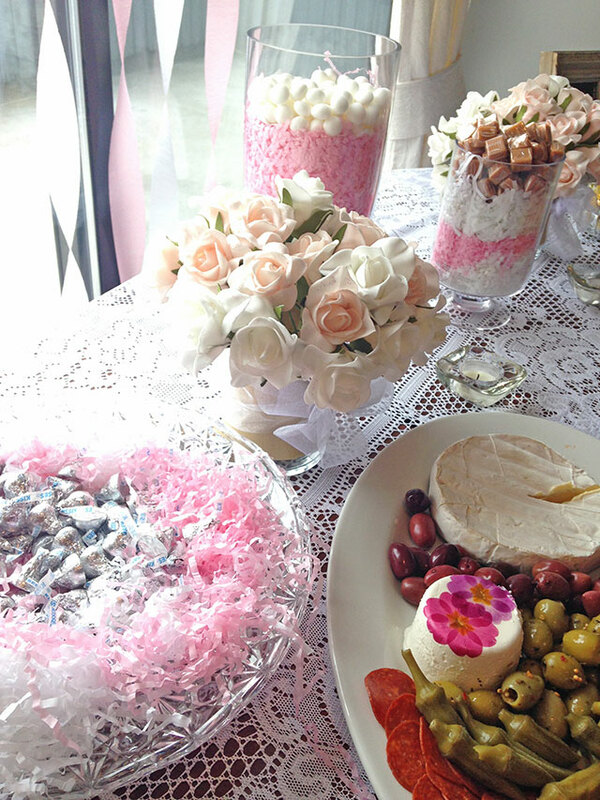 What a gorgeous party, I wish we did bridal showers in the UK. maybe when I get married I will ask my friend to throw me one.